Avmor’s EP50 MANU-MIXX CLEANER DISINFECTANT is an oxidizing multi-purpose degreaser and deodorizer, effective against Herpes Simplex Type 2, Influenza Type A2/Japan and HIV-1 (Human Immunodeficiency Virus), for hard, non-porous surfaces in industrial and institutional areas. EP50 MANU-MIXX CLEANER DISINFECTANT is designed for use in hospitals, nursing homes, hotels, schools and food service establishments. Effective on sinks, faucets, counters, urinals, toilets (non-water covered surfaces), and all hand contact surfaces as well as walls, stalls and floors. Organic ingredients in this product are readily biodegradable in accordance with OECD 301 standard. NOTE: To avoid excess foaming, pour water first then EP50 MANU-MIXX CLEANER DISINFECTANT. See dilutions below. 1. Squeeze the EP50 MANU-MIXX CLEANER DISINFECTANT bottle to dispense the required amount of product per application. 2. Pour EP50 MANU-MIXX CLEANER DISINFECTANT into a spray bottle or bucket. Remove gross filth and heavy soil deposits. A pre-cleaning step is required and recommended for heavily soiled areas. DISINFECTION: When used as directed, EP50 MANU-MIXX CLEANER DISINFECTANT kills 99.99% of the following bacteria in 5 minutes: Staphylococcus aureus, Salmonella choleraesuis and Pseudomonas aeruginosa. When used as directed, EP50 MANU-MIXX CLEANER DISINFECTANT kills the following viruses in 5 minutes at room temperature (20 +/- 1°C): Herpes simplex virus Type 2 and Influenza A2/Japan. 1. To ensure performance of the product against bacteria and viruses mentioned above as claimed, use 295 ml of EP50 MANU-MIXX CLEANER DISINFECTANT per 3.78 litres (1:12), using cold tap water. 2. Apply solution with a spray bottle, cloth, sponge or mop to wet thoroughly. 3. Allow to remain wet for 5 minutes and then let air dry. Prepare a fresh solution for each use. HIV-1: When used as directed, EP50 MANU-MIXX CLEANER DISINFECTANT kills HIV-1 (Human Immunodeficiency Virus) in 5 minutes at room temperature (20 +/- 1°C). Clean blood or body fluids from surfaces before applying EP50 MANU-MIXX CLEANER DISINFECTANT. Personnel that clean items soiled with blood or body fluids should be cautioned to wear protective clothing including latex gloves, smock, mask and eye goggles. Cleaning materials and clothing soiled with blood or body fluids should be autoclaved and disposed of according to local regulations. 1. Use 7.8 ml of EP50 MANU-MIXX CLEANER DISINFECTANT per litre (1:127), using cold tap water. 2. Treated surfaces must remain wet for 5 minutes. Prepare a fresh dilution solution daily. MULTI-PURPOSE CLEANER: 1. Use 30 ml (1 oz) of EP50 MANU-MIXX CLEANER DISINFECTANT per litre using cold tap water (1:38). 2. Spray directly onto the surface and wipe clean. Repeat as needed for applications. GLASS CLEANER: 1. 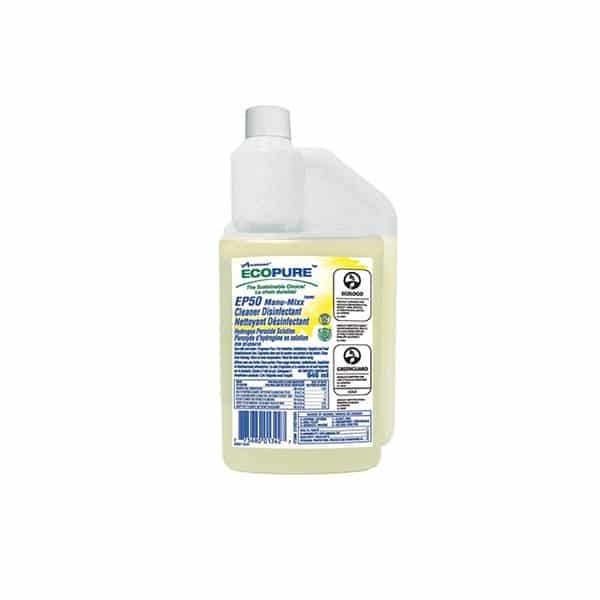 Use 7.8 ml (1/4 oz) of EP50 MANU-MIXX CLEANER DISINFECTANT per litre using cold tap water (1:127). 2. Spray directly onto the surface and wipe with a cloth, a sponge or a squeegee. FLOOR CLEANER: 1. Use 7.8 ml (1/4 oz) of EP50 MANU-MIXX CLEANER DISINFECTANT per litre using cold tap water into a mop bucket (1:127). 2. Mop floor area. 3. Pick up excess solution. CARPET CLEANING: Use 7.8 ml (1/4 oz) of EP50 MANU-MIXX CLEANER DISINFECTANT per litre using cold tap water (1:127). Apply solution to surface to be cleaned with a bonnet mop, carpet extractor, spray bottle, cloth or brush. Agitation may speed up the cleaning action. Once soils are loosened, pick-up solution with an extractor, wet dry vacuum or a damp cloth. CARPET STAIN REMOVER: Use 295 ml (9 oz) of EP50 MANU-MIXX CLEANER DISINFECTANT per 3.78 litres using cold tap water (1:12). Apply solution to surface to be cleaned with a bonnet mop, carpet extractor, spray bottle, cloth or brush. Agitation may speed up the cleaning action. Once soils are loosened, pick-up solution with an extractor, wet dry vacuum or a damp cloth. HEAVY DUTY CLEANING: Use 295 ml (9 oz) of EP50 MANU-MIXX CLEANER DISINFECTANT per 3.78 litres using cold tap water (1:12). Spray directly onto the surface and wipe clean. Agitation may speed up the cleaning action. STORAGE: Do not contaminate water, food or feed by storage. Avoid freezing conditions. Avoid high temperatures. Do not exceed storage temperatures of 35°C (95°F). Best storage temperatures are between 1,66°C et 29,4°C (35°F et 85°F). Overheating and light in storage may result in increased degradation of product, which will decrease product effectiveness. Keep concentrate away from incompatible materials. CONTAINER DISPOSAL: Completely empty container. Do not reuse empty containers. Plastic bottles must be triple rinsed and recycled. RECYCLING: This product package including the container, label and shipping carton are all designed to be recycled. Follow all Federal, Provincial and Local regulations regarding waste disposal.